Wondermum is New Zealand’s only birth pool hire service that provides Original, fitted, Eco-friendly & Non-Toxic Liners with every Birth Pool Hire. Our pools & liners are Free From BPA, Latex, Cadmium, Lead & other heavy metals, as well as meeting the EU regulations on phthalates. 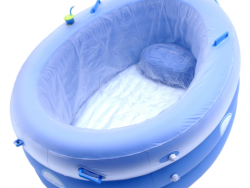 Birth Pool Hire NZ includes everything you need for your water or home birth. Every kit comes with a sterilised birthing pool, an original non-toxic liner as well as a filling and emptying kit. Our birthing pools have inflatable floors for your comfort. If this is your first baby, consider buying your own birth pool so that you can use it again and again! Which pool should I use for my water birth?